“Shazam!” -- Although not a stellar movie, “Shazam!” still delivers the goods in a fun and engaging way. Mind you, this is a DC produced title, so the color scheme and palate is not as bright and vibrant. It is slightly different from most Marvel-based entries, since the DC universe has its own way of color correcting its films. Angel a 14-year-old orphaned kid who accidentally wanders off school grounds into an abandoned subway station where he meets Djimon Honsou’s “Shazam!” of the title. This aspect is kind of ironic, since he recently appeared in “Captain Marvel” as Koran, one of the soldiers who turned out to be unsavory. This is where the story shifts and turns it to a more darker side. Mark Strong’s Dr. Silva who has an old score to settle with his own father, John Glover’s Dr. Silva. Part of Dr. Silva’s demise comes in the form of meeting a death via the Greed aspect of one of the seven deadly sins. Strong’s Dr. Silva was rejected by Shazam many years ago, so he feels slighted by just the mention of his name. When it comes to it, however, comic book movies are just supposed to be fun. Throw out all the notions that were in the WWI setting of “Wonder Woman” and the misfire that was 2016’s “Suicide Squad” that was just plain disappointing. I think “Shazam!” will ultimately not change a thing when it comes down to it. It will be another one in a long line of titles that will just kind of passing through since I have a feeling that superhero fatigue that is inevitable. Directing chores on “Shazam!” were handled by David M. Samberg who did a competent job with the creepy and eerie “Lights Out” in 2016 as well as that annoying creepy doll tale that was “Annabelle: Creation.” As I’ve said I the past, I don’t do horror tropes that are just sheer ridiculous or preposterous in nature. When it comes to it, this is a simple family film that looks at how families’ can come in any shape, size or color. It also has a lot to say about bullies and the like, since it shows they will get their just desserts in the end. I hate to say it, but I’ve seen better and I’ve seen worse when it comes down to it. 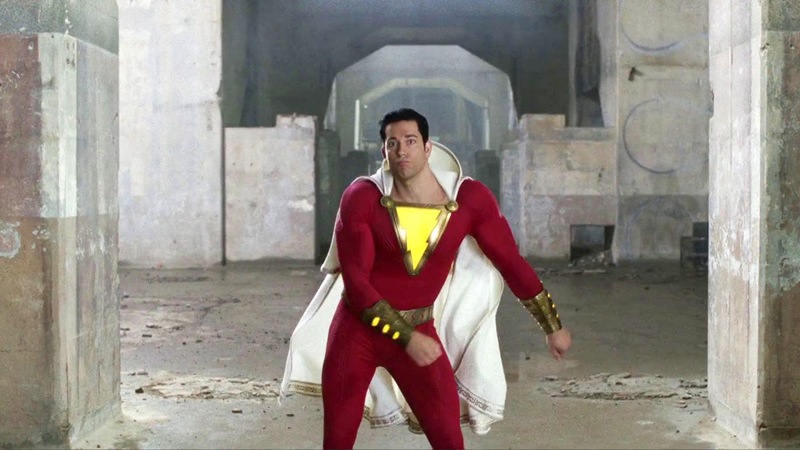 “Shazam!” is a fun movie, but just wait for the discount house, because it is not a movie worth shelling out ten bucks for.